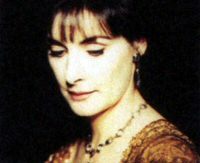 In the past years, Enya has performed for the Queen of England, the King of Denmark  and the Pope. In a previous century, she could have been a court musician. But over the last 11 years she has become better known as a universal musician, the 33 million albums she has sold around the world testifying to the wide spectrum her lush, layered, beautiful melancholy music reaches. Unlike Ireland's other major pop export, U2, Enya doesn't like to brag, talk about her personal life, perform, make public appearances or even grant interviews. Instead, she locks herself up in a countryside studio with the producer Nicky Ryan and his lyricist wife, Roma, and can take months to write a single melody and even longer to record a version of it that she is satisfied with. After a month of requests and delays, Enya consented to an interview to discuss her fifth album, Paint the Sky with Stars (Reprise), a compilation of her favorite and best-known songs along with two new ones. In revisiting your past albums and laying the songs back to back for this compilation, did you come to any new realisations about your music? "I must say I enjoyed the experience. I relived the songs completely: the beginning, the middle, the end, the writing of the melody, the parts that worked wonderfully and the parts that didn't work. It's like a diary of what I did each day. Musically I was quite happy because though sometimes it's very subtle, I know there's a progression on each album and my voice has been maturing." Tell me about your new single, "Only If." "'Only If' was a positive message, and it was linked with the fact that this was a best-of album. The message was to take that step, do what you want to do now, even if it involves a risk factor. It's a great feeling to do it, and I feel I've done it personally. I've been writing music regardless of the fact that there wasn't anybody else doing this music. Sometimes that can be difficult, but that's what the song is about." Do you consider it a compliment when bands like the Fugees sample your music? "I would have been flattered had they asked me. But I was completely hurt because on the back of their album, the other people who are sampled are credited and I'm not. Immediately the publisher wanted to pull the song off the album... but when their manager heard about it, he got in touch with me and Nicky and Roma and apologized. I was concerned about my fans because a lot of rap albums have obscene language and I didn't want people to think I would be involved. But their manager explained the band's message and that it's different because it's hip-hop, not rap. I thought about it and I know what it's like to work so hard in the studio, so we decided to let them leave the song on, but with a sticker on the back." Do you have any kind of explanation for why music is able to reach such a deep, private, emotional place in listeners? I find that music makes people just sit and listen, firstly. Then, they seem to interpret their own emotions with the music and it makes them ponder their own life a lot. And then they start to question: Am I happy in my work? Am I happy in my relationships? What am I striving for? It makes them take that moment, because I feel that in this day and age people don't take a moment for themselves. It's a noisy environment we all live in, whether it's traffic or the workplace, so it's very difficult to think about your life in general. A lot of people are afraid to do that. They like to hide behind their work and not face up to a big problem in their life. For example, a gentleman in New Zealand said I saved his marriage. The story went that he and his wife were at the stage where they just didn't speak to each other any more. Then he bought the album Watermark, and they sat and listened to the music. They both really like it and began to comment on the songs, and then they started talking to each other. I met them last year, and they're still married.